Dried lime (also known as: black lime; noomi basra (Iraq); limoo amani (Iran); loomi (Oman)) is a lime that has lost its water content, usually after having spent a majority of their drying time in the sun. 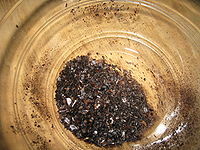 They are used whole, sliced or ground, as a spice in Middle Eastern dishes. Originating in Oman — hence the name limoo omani and Iraqi name noomi basra (lemon from Basra) — dried limes are popular in cookery across the Middle East. Dried limes are used to add a sour flavor to dishes, through a process known as souring. In Persian cuisine, they are used to flavor stews and soups. Across the Arab States of the Persian Gulf, they are used cooked with fish, whereas in Iraq they are added to almost all dishes and stuffing. Also, they’re made into a warm drink called Hamidh (sour). Powdered dried lime is also used as an ingredient in Arab States of the Persian Gulf-style baharat (a spice mixture which is also called kabsa or kebsa). It is a traditional ingredient in the cuisines of Iran and the Arab States of the Persian Gulf. Dried limes are strongly flavored. They taste sour and citrusy like a lime but they also taste earthy and somewhat smoky and lack the sweetness of fresh limes. Because they are preserved they also have a slightly bitter, fermented flavor, but the bitter accents are mainly concentrated in the lime’s outer skin and seeds. Dried lime tea is a type of herbal tea made from dried limes and is a popular beverage in Iraq where it is used to aid indigestion, diarrhea, and nausea. ^ Ayelet’s Comfort (2015). “What is Noomi Basra?”. Retrieved 10 October 2015. ^ a b Basan, Ghillie (2007). Middle Eastern Kitchen. NY, USA: Hippocrene Books Inc. p. 78. ISBN 9780781811903. ^ Billock, Jennifer (2017-11-15). “Heard of Black Lime? Here’s How To Use It”. tales of the cocktail. Retrieved 23 August 2018. ^ GERSHENSON, GABRIELLA. “SOUR POWER: COOKING WITH DRIED LIMES”. saveur. Retrieved 23 August 2018. ^ Butcher, Sally (2012). “Legumes and Pulses”. Veggiestan: A Vegetable Lover’s Tour of the Middle East. London, UK: Pavilion Books. ISBN 9781909108226. ^ Shafia, Louisa (2013-04-16). The New Persian Kitchen. CA, USA: Ten Speed Press. p. 10. ISBN 9781607743576.